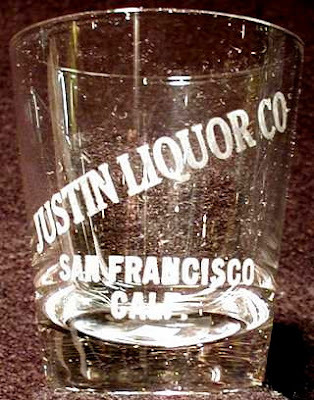 No record of the Justin Liquor Company exists prior to 1905. In that year, Justin Taravellier and Louis Cames partnered up and the Justin Liquor Company embarked on it's short career into the wholesale and retail liquor trade. Taravellier had prior experience in the form of retail liquor sales, tending the bar at his hole in the wall saloon located at 23 6th St. in "The City". Cames, on the other hand had been a mail carrier for the post office prior to entering the liquor business. How he and Taravellier came to be partners was at first a mystery. Cames residence was half way across town, too far to become acquainted in the saloon and too far from Taravelliers home to have been neighborly. Regardless, as 1905 dawned, they became co-owners of the upstart Justin Liquor Company and set up shop at 317 O'Farrell at the corner of Mason St.
After what seemed like hours of sleuthing, an obituary in the San Francisco Call dated April 13, 1902 appeared and the mystery was solved; Taravellier and Cames were related; their lineage traced back to France. Other than that nugget, and a delinquency notice filed against Taravellier for $50~ (late payments on shares of stock) by the Kilauea Sugar Plantation Company, both managed for the most part to avoid the press. In fact, the Justin Liquor Company never placed an ad. 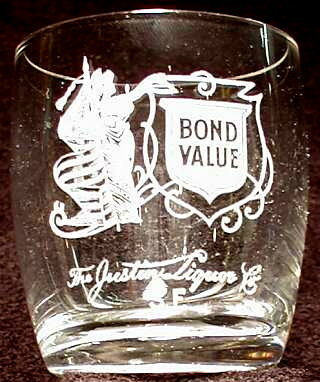 However, they did have two variants blown of an amber quart cylinder and had one order filled for two different etched shot glasses with the company name emblazoned on the front. The bottles are rare. We've had a total of three over the years, two with net contents (one was damaged) and only one of the Full Quarts. I don't recall seeing more than a couple of others. The glasses are also exceptionally rare. There are two different styles in existence; one is simply lettered, the other is a "picture" glass. I've had one of the less ornate of the two, and have seen one other and one of the picture glass. The Justin Liquor Company disappeared just as fast as it surfaced. There is no record or mention of the company after 1905. So what happened? It appears that the company managed to hang on by a shoestring into 1906. Oddly enough, there is no mention of the Justin Liquor Company in 1906, only reference to a saloon at the 317 O'Farrell address. On April 4, 1906, the bartender in the saloon at that location reported a burglary whereby someone entered the premises and stole the cash register. No cash was taken since it was empty (obviously business was booming..) and the sum total of the loss was the register itself. It was later recovered in a yard at 357 O'Farrell St.; just a few doors down. A couple of weeks later, the Great 1906 Earthquake and Fire sounded their swan song. Both the Taravellier and Cames residence, and the business address for the Justin Liquor Company (actually again just a saloon proper), were smack dab in the middle of the burned district. San Francisco was dry (no liquor sales permitted) from April 18, 1906 onward into the summer. As normalcy slowly returned to the city, so did the flow of liquor. On August 14, 1906, a saloon license was granted to Taravellier and Cames to be located at 2768 Mission. The post earthquake 1906 Crocker Langley states simply, Taravellier and Cames, liquors, 2778 Mission (I verified both addresses and am guessing that the discrepancy is a typo error). No mention of the Justin Liquor Company at all.